May 2 -11: from $159/Nt! 5% Off 7 Nts! Gulf Front! STEPS to Beach & HD Smart 70"
Make Palm Beach resort condominiums your Gulf FRONT destination. You are only STEPS from our "powder" white sand beach! This premier low-rise property is within an easy day’s drive from Birmingham, Jackson, Atlanta, Nashville, Memphis, Little Rock and other great American cities. Otherwise, you can fly into Mobile or Pensacola and drive only an hour to your vacation home. 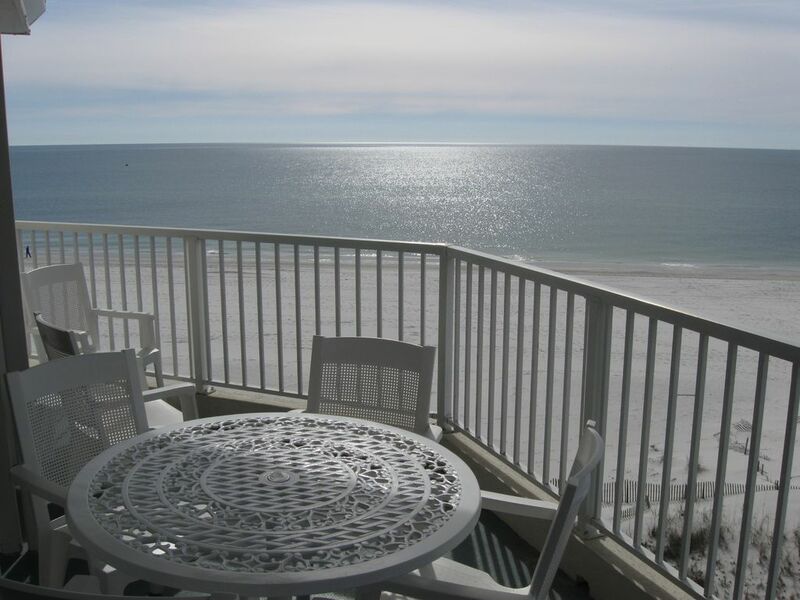 This very comfortable 1,681 square foot 3 Bedroom/2 Bath Gulf Front condo is on the 5th or top floor. Enjoy your panoramic view of the beach and the always 84 degree pool below. Our condo is the perfect size for a medium sized family with relatives or even 2 families. Enjoy complex wide FREE WI-FI and our flat screen TVs with DVD players in all the bedrooms with a HD 70' Smart TV in the living room! Also, play your tunes or listen to on-line radio with the bluetooth speaker adjacent to the Kitchen bar. Bathe in your mammoth-size shower or a separate Jacuzzi tub in the master bedroom and a dual basin vanity allows you to get ready with ease. Wash and dry clothes in your unit too. Then, the fully accessorized kitchen will make you feel as if you are home, but with a grand Gulf front view! Relax with all the amenities and come stay in our beach home! Come....Stay at our condominium home. Enjoy fine Gulf front resort living and create some of your best and most lasting memories. Susan, my lovely wife of 47 years, and I are retired. After downsizing in the North, we bought this condo in 2008 and ultimately purchased another condo on the vibrant East side area of Milwaukee near Lake Michigan. Its Orange Beach winters and Milwaukee summers. Susan and I stay busy with grandkids, good cardio exercise, and toasting what made Milwaukee famous. However, and seriously, we entered the rental business, a business driven with passion to create satisfied customers, or more simply, just make happy folks happier! Richard and Susan "Our Mission is Your Return"
Palm Beach Condominiums is located just 3 miles east of Route 59 and just a dozen beach houses removed from the mile and a half Gulf State Park shoreline. The nearest hi-rise is a good 1/2 mile further to the east. All this means you can enjoy the beach without the big crowds! When combined with your close proximity to restaurants and shopping, Palm Beach Condos offers the best of both worlds, i.e. being centrally located in a lower density Gulf front area! toilet, tub, shower, jetted tub, Huge Shower! Enjoy the luxury master bathroom with its duel basin sinks, separate Jacuzzi tub, and huge shower with oversized shower head! On the Gulf of Mexico. Beautiful Sand Beach and Super Clean! Actually, right on the Gulf of Mexico - Absolutely, Gulf Front! Overlook the Gulf of Mexico Directly! Absolutely Gulf Front and a View of Gulf from EVERY Room! Palm Beach Condominiums, Orange Beach, Alabama. Unit A51. Totally Gulf Front Unit, 3 Bedrooms, Family Friendly. 2 Queen Sofas (1 is a Sleeper) + Leather Chair in LR with 70' Smart HD TV! We provide both a single cup Keuric coffee maker and a 10 cup coffee Cuisinart drip maker. Cone filters for the 10 cup are provided, but for both, bring your own coffee. Everything a Chef would Need! All Bedrooms and the Living Room have HD Flat Screen TV's. 70' in Living Room; 47' in Master; and 37' Sets in Queen & Third BRs. Wireless High Speed Internet Access is FREE! A wall mounted bluetooth speaker is located in the kitchen area next to the bar counter. Gulf Front with Eatting Table, Plenty of Chairs and a Chase Lounger Too! Bicycle Rental Available across the Street or Elsewhere on the Island. A comfortable and large balcony overlooks the Gulf of Mexico directly. You may access the balcony through siding glass doors either off the master BR or the LR. (2) Two Large Pools that are Always Heated to 84 Degrees! Plenty of Lounging Furniture Surrounds Each Pool! Always 84 Degree Heated Pool, Fewer than 4 Miles to Super Wal-Mart and 3 Other Grocery Stores, Non-Crowded Beach as Closest Hi-Rise is 1/2 Mile to East and to West is 1.5 Miles of Gulf Shores State Park Beach. Stay connected and entertained in this 'superior' class unit. Enjoy the game or a DVD on your 47' High Definition Flat Screen Television! Surf the Web or work your e-mails at broadband speed with our Free Wireless Internet access. Listen to the radio or play a CD on the stereo system provided. All the bedrooms sport 32' to 37' flat screen televisions with DVD players too. We had a great time here. Everything is very nice and clean. The beds were very comfortable and kitchen upgrades are awesome. Richard and Susan were great to deal with from the very beginning. I would definitely recommend this place to anybody. Very nice resort. ABSOLUTELY LOVED OUR CONDO!! HOME AWAY FROM HOME!! Plenty of room for 2 families. Loved the layout of condo. Had a GREAT time! GREAT VIEW, very nice pool. Our boys LOVED this place. They didn't want to leave. OWNER IS VERY NICE!! Had a great week over spring break. The condo was perfect and well stocked. It overlooks the ocean and pool . The only thing , this pool was closed due to resort renovations so the kids used the other heated pool on the property, which was a little crowed due to families on break. Lots of things to do in the area . Overall a great, relaxing week! We had a lovely couple days in this condo. Beautifully decorated, updated, wonderful beds and very clean. It’s located on the upper corner with a fabulous view of the ocean. Beach was just a few steps away and amazingly quiet, especially for college spring break week. Loved everything about it. Highly recommend. A beautiful and safe property. The unit has everything you would need for a great vacation. Highly recommended. Another fun time in A51. Great view and good size condo for family. Owner was very accommodating and we had a blast as usual. Gulf State Park is both to our East and North. Enjoy the Park's 1.5 Miles of Undeveloped Beach or Walk/Bike through the Park on it's 27 miles of improved pathways. You may book online Credit Cards Accepted: Master Card, Visa, American Express or Discover - 3% Surcharge Will Be Added. All Rentals Subject to $30 Reservation Fee, $155 Cleaning Fee & 13% AL Taxes. Minimum Age Limit for Renters: 25 Years. No Pets are Allowed. 24/7 Fast & Easy On-Site Check-In and Check-Out! Drive right to Palm Beach Condominiums and you are on vacation!